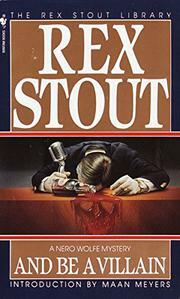 The mountainous maestro, Nero Wolfe, spurred by the income tax, sells assorted clients the idea of his solving a murder six days old -- that of a horse racing tipster poisoned after taking a soft drink on a radio program advertising the drink. Overhauling his suspects, Wolfe backtracks on the interrelated lives of those connected with the program, trades with Inspector Cramer to get the New York police to do the detail work, runs Archie Goodwin ragged, inspects radio advertising ethics, is unable to prevent two more killings. He unties a complicated blackmail setup, pulls an answer out of thin air and makes it stick. Fat man ferreting de luxe.